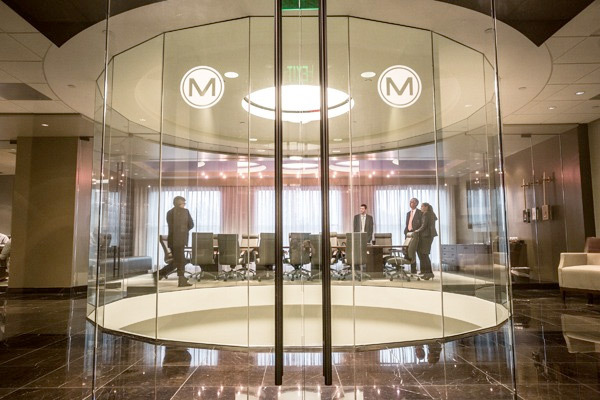 When The Marston Group PLC, a Memphis-based certified public accounting and financial consulting firm, held an open house in recent weeks at its new digs, the evening portion of the event lasted from 7 till later in the night, with the last person leaving around 10. The Marston Group PLC offices at 1661 International Drive in the building known as the Colonnade. The next day, when senior partner and CEO Chip Marston talked about the event, the energy and excitement from the night before was still there – about how far his firm has come and about what is on the horizon. The company moved to the second floor of the 89,000-square-foot, four-story building there known as the Colonnade. It was a relocation from Primacy Parkway that was needed because the firm’s clients and business have grown, and The Marston Group wanted to rethink the functionality of its workspace and layout design after being in the same place for almost 20 years with three expansions. Marston described the new space as a better match for the firm’s corporate identity and more convenient for clients – as well as a “brighter, more vibrant office environment inside.” Graham Reese of Graham Reese Designs helped fashion the space and make it a good fit for the accounting firm’s more than 25 employees. “It’s going to be a very dynamic year for us,” Marston said, referring to both the new office and the fact the firm is continuing to add to its ranks. Recently, for example, The Marston Group – which was founded in 1985 – added Terry Courtenay as a member of the firm’s practice. Courtenay, a certified public accountant, has experience providing tax and advisory services to predominantly family-held businesses, and he’s worked with a variety of businesses, including in the fields of real estate and agriculture. The Marston Group works with both individuals and companies, with the individuals often being members of multigenerational families who own companies, trusts or estates. The firm’s services include accounting and consulting, tax preparation, general business consulting, litigation support for contract disputes and divorces, and also the attest function, an independent review of data and research from an audit. Besides accounting, the firm is known for its mentorship. Senior leaders make themselves available to provide expertise and advice to a number of startup-related and entrepreneurial initiatives around town, including Marston and Chief Operating Officer Jimmy Dickey taking on mentorship roles for last year’s Everywhere Else Startup Conference. On his biography page on the firm’s website, Marston has included a quote from Lucius Annaeus Seneca: “As long as you live, keep learning how to live.” It reflects what he presents as the evolving nature of the firm and its work – and its adaptability.